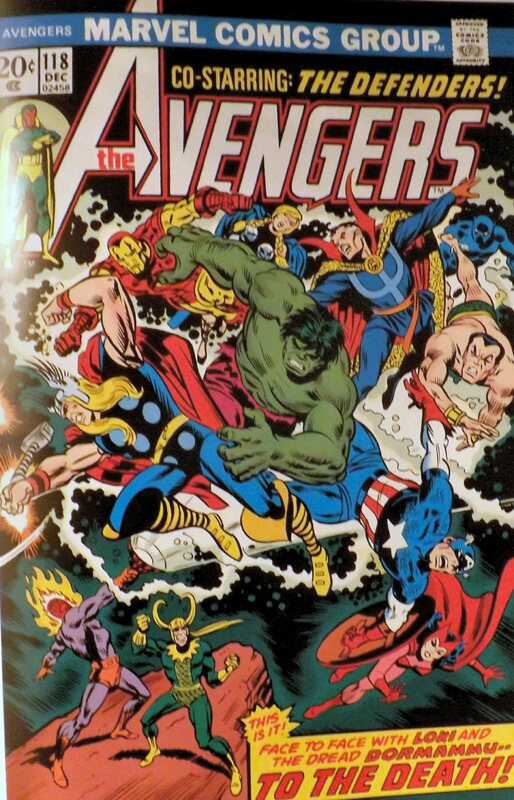 The new Avengers movie is based on characters created by Marvel Comics. Pictured is a classic cover from our collection. Going in to see Joss Whedon’s Avengers: Age of Ultron, I was not happy. As to be expected, even on the second day, one had to wait in line an hour before the showing time to get a seat. The answer: yes. It’s no secret that strangers on airplanes feel oddly prompted to tell you their life stories, and apparently, strangers in line at a movie theater feel the same. Also, before I get to my review of the film, let me throw in a quick tip to anyone who has ever been saddled with the task of cleaning a large spill the size of a pond. Yes, it is much easier to use a mop than to unravel two industrial sized rolls of paper towels onto the mess. As I stood stoically in line, I painfully watched two movie theater employees try to clean up a large spill by throwing paper towels on it and using the wax on, wax off method. Please spread the word about cleaning up spills, so no one ever has to suffer through that again. I know, I know, just get to the movie. Avengers: Age of Ultron, is a must see. If you can make it through all of the trailers for the upcoming comic book to screen adaptations, and believe me, there will be many, Age of Ultron will delight. It starts right in the middle of things, with incredible action sequences, and from there, the action rarely stops or even slows. Every Avenger has a sense of humor and great comedic timing. There are even scenes devoted to comedic relief, and I’ll get back to this later. Furthermore, the film also features incredible special effects and several scenes of Hulk destroying everything in his path. And the film had a large scope, having been shot in Bangladesh, South Korea, and South Africa, along with the UK and Italy. Moreover, The Avengers all get about equal time on the screen, which is great if you’re a diehard Hawkeye fan and were disappointed by his contemporaries monopolizing screen time in the first film. What’s more, all of the characters have great chemistry. The comradery is believable and only serves to add to the already exceptionally well-made film. However, I’ll warn you now about Age of Ultron’s misgivings. First, there’s too much comedy. Even in what’s supposed to be an intense battle, there are jokes. If comedy is peppered throughout, constantly, there’s no room for the viewer to ever feel that the protagonists are ever in real peril. This leads me to my next qualm with the film: the villain. Ultron is hilarious. He’s a funny robot, clearly just trying to live out his comedic dream of standing behind a brick wall, and that’s a problem when all of the Avengers are seemingly doing the same thing. There needed to be a source of pure darkness and evil in the film, and sadly, that wasn’t present in Avengers: Age of Ultron. Viewers need to feel that their heroes might not make it, but when the film is layered with light moments, it’s difficult to ever feel that way. Next time, let’s ditch the laugh provoking robot and replace it with a villain viewers can fear, so the next Avengers film can be more than two hours of intermittent giggling in the movie theater. And one last thing, can someone please teach Robert Downey Jr. what sipping from a coffee cup should look like? Thanks in advance. Oh I just loved the film! I thought the locations were fantastic. It had me on the edge of my seat the entire time! I enjoyed this review. Standing in line is the worst!! But this time it was worth it to see that Chris Hemsworth… Yum yum!! LOL!